@martijnr, @Tino_Kreutzer and I realized there was some strangeness around the compact, compact-n, horizontal, horizontal-compact appearances. That is, it wasn't exactly clear what their intended behavior was and they are not currently consistently supported by clients. We had a discussion on this XLSForm spec issue that I wanted to draw attention to. compact-n, horizontal and horizontal-compact should be deprecated. columns, columns-n and columns-flex should be introduced. compact should be an optional modifier on those. maybe just columns-n? horizontal and horizontal-compact currently don't exist in ODK Collect so overall this change will have minimal impact. I mostly want to share this here so maintainers of other compatible systems are aware of this change. Of course, if you have other thoughts, please share! @martijnr Of course, as I try to write this out I come up with more questions. I believe this change should also mean that compact becomes compact columns-flex, right? All of these wrap to other rows as needed. The difference between columns and columns-flex is pretty subtle. @martijnr columns-flex (currently horizontal-compact) is one that only Enketo has so it would be good to get a more precise description. In the new world, does compact also modify a vertical list? We don't have that option currently I don't think. I believe this change should also mean that compact becomes compact columns-flex , right? No, it would stay compact. The columns-flex addition would not do anything when combined with compact. This is the weakness in the proposal, but at least it is foolproof. There is no mutual exclusivity between them. The columns-flex appearance is essentially a less compact version of compact as it doesn't remove radiobuttons and checkboxes. Ok, I was getting horizontal and horizontal-compact confused, I think. So in the new world, columns-flex is identical to compact except that it includes radio buttons and checkboxes? And compact is a modifier but it only can modify columns-n? This I'm not feeling very good about. How does horizontal/columns behave (it only exists in Enketo)? I'm guessing it associates a particular column count with a screen width range. Does it take the element width into account? That is, if I have screen width X, do I always get Y columns even if the width of the image or label would make them overlap? In the case of labels, does it wrap them if they don't fit? So in the new world, columns-flex is identical to compact except that it includes radio buttons and checkboxes? Yes. The word is not ideal. I think the ideal would be to call this horizontal, but unfortunately that would be a breaking change for existing forms (due my bad choice in the past). And compact is a modifier but it only can modify columns-n? Compact works by itself, by making everything as compact as possible (margins, hiding radiobuttons/checkboxes, displaying horizontally). So it is independent from columns. Only columns-flex has an overlap with compact unfortunately. It does wrap labels, and it has some fixed margins. It will make all columns the same width and the number of columns will be adjusted based on the space available (in real-time, also when switching between portrait and landscape on a phone). I believe the maximum is 3 columns and then it adjusts to 2 and 1 when necessary. A demo can be seen at https://enke.to/::widgets by changing the width of the browser screen to see how it switches between 2 and 3 columns based on available width. I think it can be thrown off by very long label words (so that's a bug). it's unclear what horizontal does and what its relationship to the others is. Given how confused I am trying to explain the suggestion and how the proposed appearances do and don't combine, I don't think we've addressed the second two points. I have a strong preference to only introduce a modifier if it is used consistently. That is, in the proposal above, compact is a modifier but only in one case AND it can also act alone. with modifier show-buttons or markers that can apply to any of them. It's really easy to understand, there are no compatibility issues and it adds the missing combination. And just to add my problem with this proposal is that compact actively hides radiobuttons and checkboxes, and then we have to undo that with show-buttons. So for same question were undoing part of an appearance that we just added. Ideally compact would not hide radiobuttons and checkboxes at all, and a modifier hide-buttons could hide them when desired, but that would break backwards-compatibility of old forms. Hence we've been struggling with redesigning a more logical appearance design for select questions that doesn't break anything. If we could come up with a synonym for compact that would allow us to do that. So for same question were undoing part of an appearance that we just added. While I agree it doesn't feel very clean/pure when you state it that way, I don't think that has user impact. In other words, I think someone really has to sit down and think about the appearance names to start feeling uneasy. It's really easy to describe why the modifier goes in that direction with something like "the compact-* appearances are particularly useful for images. Arranging text choices horizontally is also useful and can be achieved by adding show-buttons". As an added bonus, show-buttons can be added to vertical lists (or any other type) and the fact that it has no impact makes perfect sense. If we had a modifier to remove buttons, we'd have to either support it for vertical lists (doesn't seem very useful) or feel uneasy about why we don't. As an added bonus, there are no compatibility issues and so no user surprises. Given the number of forks and otherwise out of date clients floating around, I think that is worth giving some weight to for a relatively minor adjustment like this. This sounds good to me, @ln. Are there any reasons we can't implement this for compatibility reasons? Are there any reasons we can't implement this for compatibility reasons? Because there's no overlap between new appearance combinations and the ones that would remain for backwards-compatibility, I think the implementation is straightforward. Old forms would always work with new clients. New forms that use compact-auto show-buttons and compact show-buttons would likely interpret that as compact which is not exactly what is desired but really not bad. I think it's really about convincing @martijnr that the approach is not terrible! To be clear, I completely agree that if we were starting over we would hopefully do this differently. Well, it's seem tough... Though, if nobody agrees with my point of view, I'll stop resisting and accept! she requires a double appearance value of "compact-auto show-buttons" instead of just "columns" or something. To me this seems the most common use case, judging from the (small subset of all) the Enketo forms I get to see. I understand Collect doesn't have this feature yet, but we may see the same with Collect users when it does. 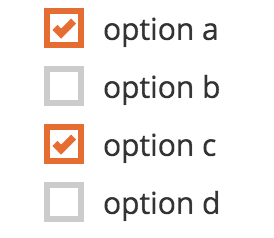 To me it seems that users are more likely to want to keep the radio-buttons and checkboxes. So having to remove them in order to show columns and then bring them back with another appearance, just doesn't seem like a great re-design (I'm diplomatic here!). I cannot escape the feeling that we can do better than that (without breaking backwards-compatibility of course). I'd find using a double appearance to a) show columns and to b) remove checkboxes/radio-buttons more logical. I certainly do agree with that. But so far the tradeoffs for what we've explored haven't seemed worth it. The "new form on old client" case is not as nice as what we discussed here because those would be shown vertically. But we can mitigate that by waiting to publish user-facing documentation until after upgraded clients have been out in nature for a while, as @martijnr suggested. I guess that @martijnr you were suggesting to keep using compact to address that somewhat but I think it is much harder to explain and keep straight than three base behaviors with a consistent modifier. That's a nice twist. I'm in favor of this proposal. I realize some people are going to miss compact (though it's not actually going away - just in the documentation in 6 months or so) but I think this is well-designed and something we can defend. While there's certainly wiggle room on how to interpret "compact", I really dont think we should consider defining "compact" as being a modifier on some other (custom) appearance value. That strikes me as a clear violation of the intention in the original spec. Which is to say, "compact" implies scrolling, so some other modifier to it would optionally specify which suite of eye candy to display for each item. The compact of the ODK world has never had anything to do with the compact from the W3C spec (and it is implemented consistently across ODK ecosystem clients). So if anything, I think that's an additional reason to deprecate the ODK-custom-compact and make clear that ODK XForms appearances are not related to W3C XForms appearances. So is "compact" in ODK ecosystem only used for images? So if anything, I think that's an additional reason to deprecate the ODK-custom- compact and make clear that ODK XForms appearances are not related to W3C XForms appearances. It works for text-only choices as well but in practice is most useful with images. That's where the desire to add something that works exactly like the current compact but does retain radio buttons/checkboxes comes in. That would be what the latest proposal would call columns. Are we ready to say that the latest take has stood the test of time? I continue to feel ok about it. @Grzesiek2010, since you're likely to take on the implementation change on the Collect side and were looking at this recently, it would be great for you to look over this thread and share what you think. @LN your approach seems fine to me. I can start looking into the code if you want.